UPDATE 3: Police have identified the suspects and released additional information – click here for details. 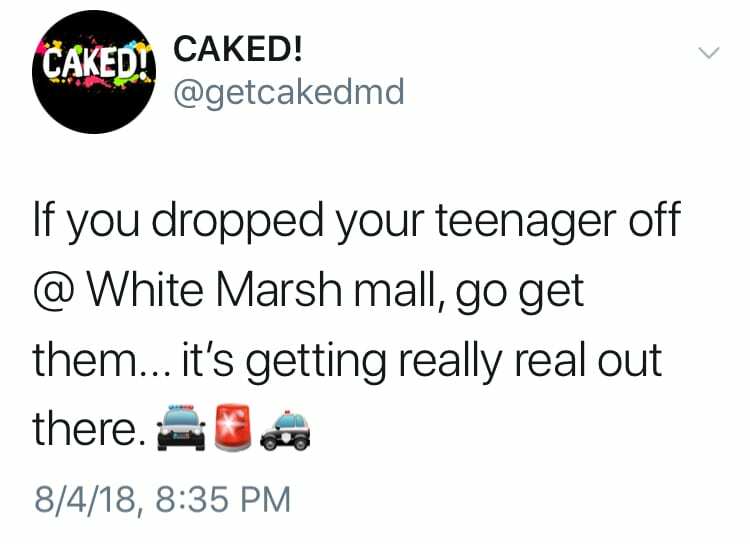 UPDATE 2: Seven juveniles and two adults were arrested outside of White Marsh Mall at just after 9 p.m. on Saturday night following a large disturbance. 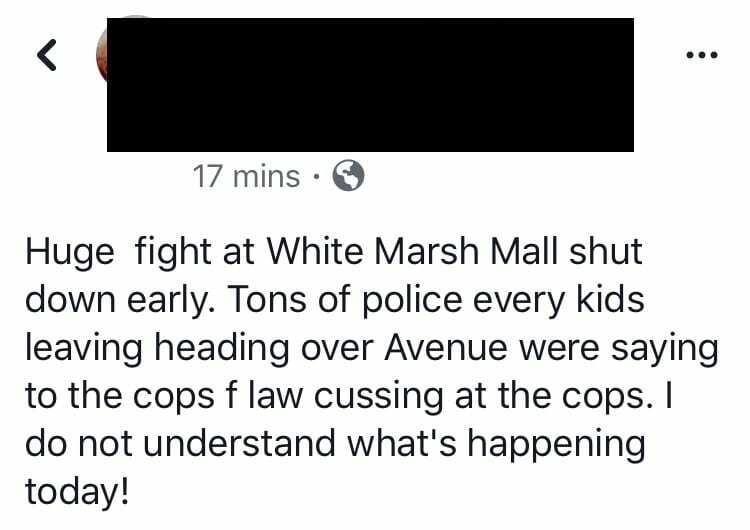 As an off-duty Baltimore County police officer working secondary employment for White Marsh Mall assisted mall security officers in moving large crowds of juveniles and young adults out of the mall and off of the property, one group became hostile with the officers. One adult suspect then attempted to punch the police officer. The officer was able to block the punch, but as he initiated an arrest for the assault, the rest of the group surrounded the officer and mall security officers. The police officer deployed pepper spray into the air in an effort to disperse the crowd. Groups of people began running away, causing additional disturbances. Some individuals onto Ring Road around the mall and began blocking the free flow of traffic. Other groups crossed Honeygo Boulevard to The Avenue at White Marsh, where a strict 9 p.m. curfew was in place. Security at The Avenue began moving the youths off of their property, as well. Officers from multiple precincts responded to assist in controlling and dispersing the crowds, as well as Maryland State Police and BCoPD aviation. The crowd was successfully dispersed when a large group left the area on a public transit bus. At this time, police continue to patrol and monitor the area while additional juveniles await rides home but the situation is now reportedly under control. This incident resulted in the arrest of seven juveniles and one adult for disorderly conduct, and the initial arrest of the adult for assault on a police officer, second degree assault, disorderly conduct, and resisting arrest. The arrestees could face additional charges. UPDATE: Police now say seven juveniles and one adult were arrested for disorderly conduct and one adult was arrested for assault on an officer. One officer deployed pepper spray. Situation now under control. Police are responding to a Saturday night brawl in White Marsh. At about 9 p.m., units responded to both White Marsh Mall for a report of a fight. Witnesses reported seeing officers attempting to arrest those involved in the skirmishes in both locations. One witness reported seeing someone attempt to fight an officer. That individual was quickly forced to the ground. There is a heavy police presence in the area and the police helicopter is searching for additional suspects.